This splendid holiday home is unique. It is in one of the most beautiful parts of the historic town of Enkhuizen. The house is well maintained and has every comfort. The interior is spacious and occupies four floors. It has a warm, intimate atmosphere. 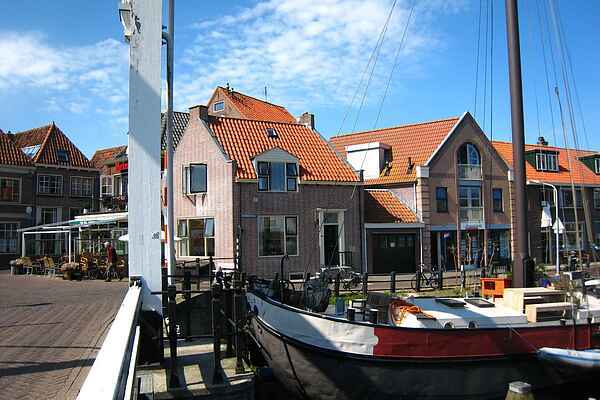 The house enjoys a superb panoramic view of the harbour, the Ijsselmeer and the locks. You can enjoy watching ships pass by and the bustling harbour. The home is ideal for lovers of water sports. Enkhuizen has a charming town centre with many restaurants and shops. There is always plenty to do here especially in summer. You can enjoy walks and cycle trips along the Ijsselmeer or boating on the lake. The picturesque towns of Hoorn, Medemblik and Alkmaar are well worth a visit. Slightly further afield, a visit to Amsterdam or the North Sea coast should not be missed. Caution: the holiday house can also be rented out for 6 guests. Please contact our service center. Attention: the holiday house can also be booked for 5 or 6 people. The fee for an additional bed is € 25 per person, per night.